Lips Down on Dixie, Atlanta's premier Rocky Horror Shadowcast, began in June of 2000 at General Cinemas' Merchant's Walk Theater. That December, the cast relocated to the 73-year-old Plaza Theatre in Midtown Atlanta (1049 Ponce De Leon Avenue, next to the famous Majestic Diner) which is still LDOD's home base today. Lips Down On Dixie appears every Friday at midnight at The Plaza: the cast is proud to be Atlanta's longest running Rocky cast and Atlanta's longest running live show, period. LDOD's slogan is "Betcha haven't seen it like this!" In its first year at The Plaza, the cast was predominantly Rocky-oriented and its efforts earned the cast a spot on the cover of the Creative Loafing newspaper. LDOD chose to be very screen accurate with its performers, costumes, props, and makeup. LDOD also presented a cabaret-style show at the Masquerade Alternative nightclub for the club's "Secret Room". In 2002, LDOD expanded its focus, keeping Rocky Horror a priority but also establishing itself as a theatre troupe, working to spread recognition beyond the midnight performances of The Rocky Horror Picture Show. Lips Down on Dixie Incorporated is a licensed not-for-profit corporation and a proud member of The Atlanta Coalition of Performing Arts. The first opportunity to really showcase the cast's talents came unexpectedly in May of 2002, when a thunderstorm knocked out power for several city blocks, including the Plaza Theatre. Instead of canceling the show, the cast just kept on performing, singing and acting out the movie with nothing but high-powered flashlights and even stronger lungs. The performance became affectionately known as "LDOD Unplugged", and its success earned the cast a spot in The Atlanta Journal/Constitution's "Peach Buzz" section, stirring interest from other theatre groups. LDOD invaded Atlanta's fetish nightclub, The Chamber, for two fetish-themed shows within a two-week period entitled "The Rocky Horror Fetish Show". The performances featured variants on traditional Rocky costumes and characters performing "Time Warp", an alternate version of "Sweet Transvestite", and an Eddie and Columbia interaction to Meat Loaf's "Paradise by the Dashboard Light." In its later years, LDOD has appeared at other local venues including Starlight Drive-In's yearly "Rock n Roll Monster Bash" (performing Rob Zombie's "Brick House" and the Black Eyed Peas' "Don't Phunk with my Heart"); Club Future, performing "I'm a Slave for You"; and Tongue & Groove nightclub's Lingerie Fashion Show. LDOD cast members continue to perform around metro Atlanta including Drag Queen / Drag King competitions at local nightclubs. Lips Down On Dixie has participated in the annual Atlanta Gay Pride parade since 2003, marching with a Rocky Horror themed vehicle or float. Lips Down on Dixie's satellite dance troupe, The Dixie Trixies, perform a non-Rocky Horror choreographed musical number at The Plaza Theater every three weeks (most are viewable on YouTube and Facebook - click here for an example). Since Labor Day weekend 2002, Lips Down On Dixie has performed at Dragon*Con, the Southeast's largest annual Science Fiction/Fantasy Convention to crowds over 3000. The Dixie Trixies are an audience favorite, performing a unique and tantalizing Trixie dance at Dragon*Con each year. 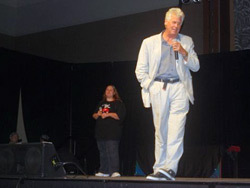 Honorary hosts of the Rocky Horror Dragon*Con show have included both Barry Bostwick and Patricia Quinn. You can see Barry introducing LDOD in 2009 here, and Patricia introducing LDOD in 2010 here. Patricia continues to rave about her experience with LDOD in interviews around the world. Key cast movers and shakers include Producer and Criminologist Aron Siegel; MC (and former Director) Candace Weslosky-Miller; Choreographer / Frank N. Furter Jevocas "Java" Green; and LDOD Inc CEO Jonathan "Leo" Avera. Aron joined LDOD in 2001. His Rocky experience began in 1978 at Atlanta's Film Forum Theater, and he belonged to three other casts before LDOD. Candace was LDOD's youngest member back in 2000, but has become one of the cast's wisest and best leaders. She met her husband at Rocky Horror. Jevocas joined in 2002 right after his birthday and has been an audience favorite ever since. Leo individually coaches every performer so that our shows, especially Dragon*Con, are screen accurate. LDOD continues to flourish with the help of new cast officers: Show Director Nik Waddell; Secretary Savannah Hoover; Treasurer Jasmine McKay; additional choreographer and long-time cast member Tory Steele; and new social media masters Michael Stork and Andy Wisniewski. LDOD wants to offer an atmosphere for young adults in the Atlanta area where they can be themselves, without the stigma of peer pressure or the influence of alcohol or illegal drugs. Not only does the cast achieve its goal of providing a danger-free environment in which kids can go wild, throw things, sing, dance, and scream audience participation lines at a movie screen, but it also puts on a performance that is cohesive, screen-accurate, and, most importantly, energetic and fun.